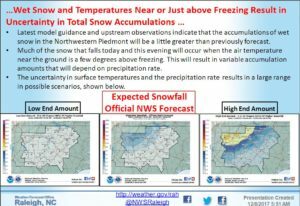 The Raleigh National Weather Service has directed Central Carolina SKYWARN to activate for the current Winter Weather event. We will hold 3 nets, one at 10 PM tonight and, then two nets tomorrow at 8:00AM and noon, all on the 146.88 repeater. If needed, our first backup will be the 147.105 repeater with tone of 82.5 Hz. Secondary backup will be the 147.135 repeater with a tone of 82.5 Hz. Tertiary backup will be the Carolina 440 UHF Link System; frequencies can be found at www.carolina440.net. 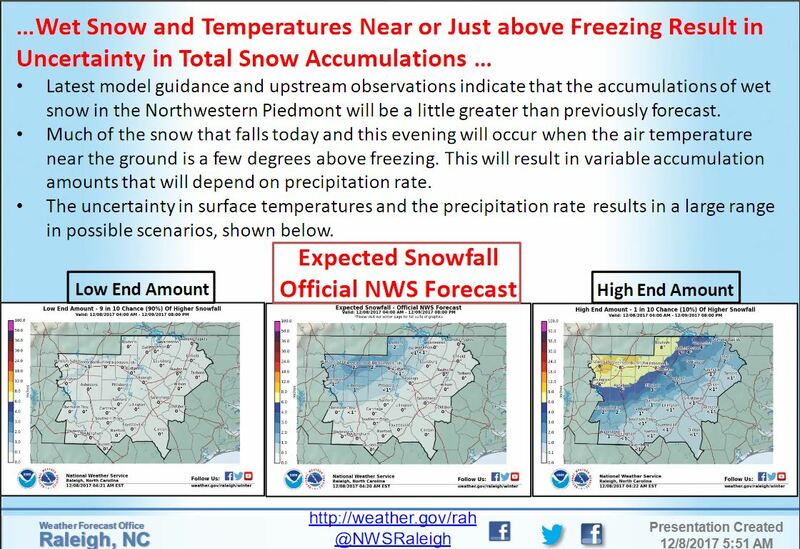 Spotters in counties within the Central Carolina SKYWARN coverage area may post any snow total reports along with your location and time on the Central Carolina SKYWARN Facebook page or call them into the Raleigh National Weather Service using the number you received during your Spotter Training. CoCoRaHS and the mPing app can also be used. Thank you! 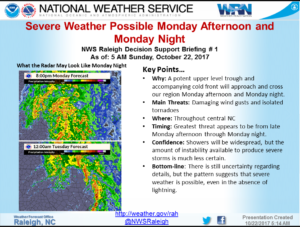 The National Weather Service in Raleigh will participate in the 19th annual SKYWARN Recognition Day (SRD) with members of Central Carolina SKYWARN on Saturday December 2, 2017. SKYWARN Recognition Day was developed in 1999 by the National Weather Service (NWS) and the American Radio Relay League (ARRL) and celebrates the contributions that volunteer SKYWARN radio operators make to the NWS. During this event, amateur radio operators will visit the NWS Raleigh office and contact other radio operators across the world and radio operators at other NWS offices. This event also serves as an opportunity for the testing of amateur radios and antennas and all other forms of backup communications. What makes this year’s SKYWARN Recognition Day event special is that Wake County Emergency Management will be participating with NWS Raleigh and will have their mobile command post trailer set up adjacent to the weather office. In addition to radio stations at the National Weather Service, several radio stations will be set up in the command post. This setup will provide an opportunity to not only showcase SKYWARN and amateur radio, but the partnership between the National Weather Service and its emergency management partners. The 24- hour amateur radio event, which is based on Universal Coordinated Time, will run from 7 PM EST Friday, December 1, 2017, through 7 PM EST Saturday, December 2, 2017. 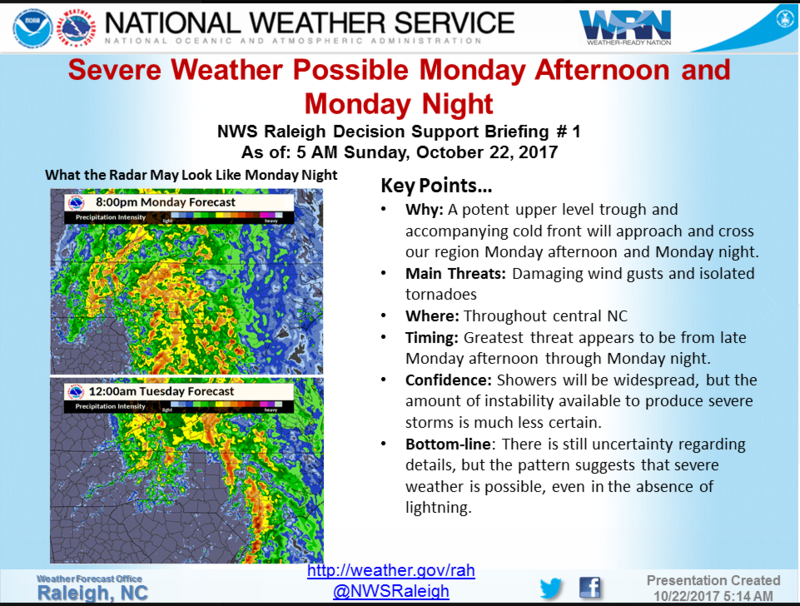 Members of Central Carolina SKYWARN will begin preparing for the event Friday afternoon, setting up antennas and radios at the NWS Raleigh office. Numerous radio contacts will be made at the start of the event Friday evening, with the bulk of the contacts made during the period starting early Saturday morning through the end of the event Saturday evening. 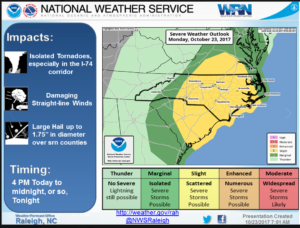 In addition to making radio contacts, during the day Saturday the NWS Raleigh will provide tours of the NWS Raleigh weather operations facility to its trained SKYWARN volunteers. Look for us on 80, 40 and 20 meters and the Central Carolina SKYWARN primary and back up repeaters; we will be using the callsign WX4NC. 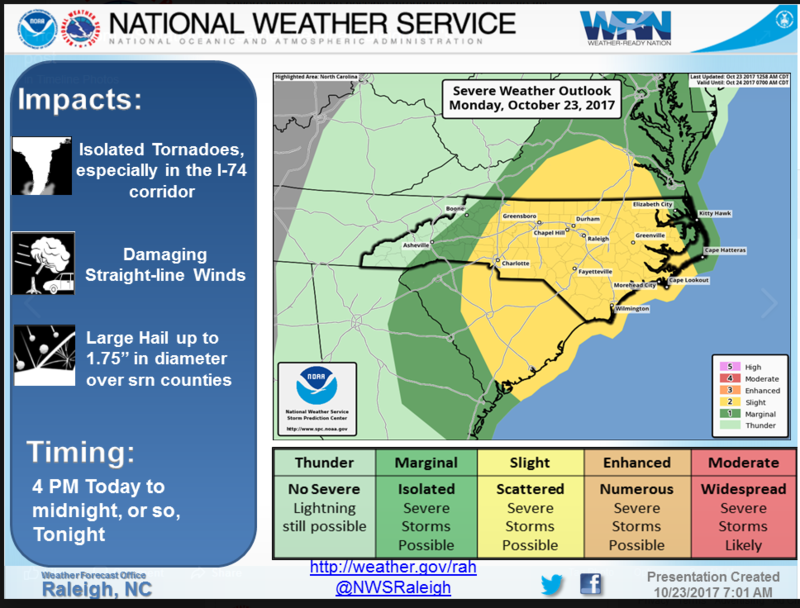 Should a severe weather activation take place later today, Central Carolina SKYWARN will use the 146.88 repeater. If that repeater becomes unavailable, we will utilize our primary back up, the 147.105 repeater in Broadway. 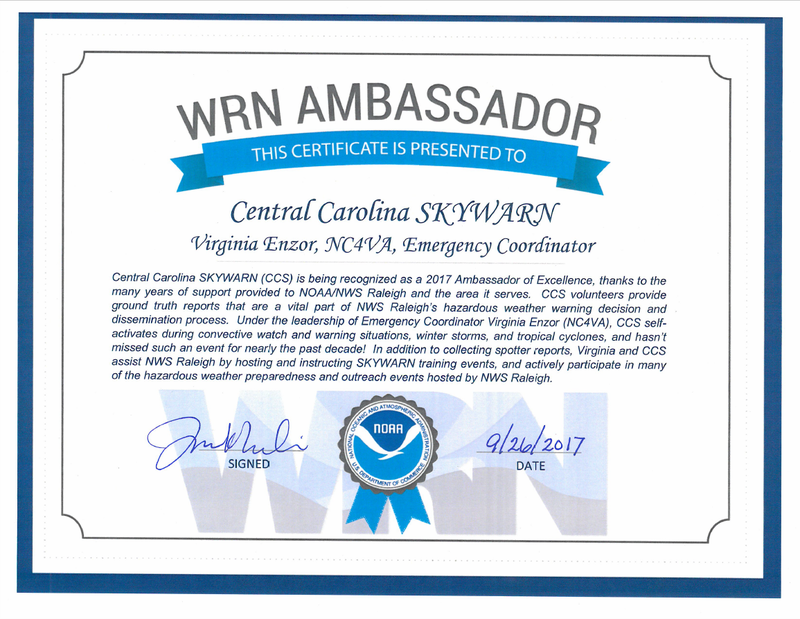 2017 NWS Raleigh WRN Ambassador of Excellence recognition! 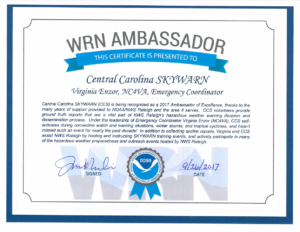 Central Carolina SKYWARN receives the 2017 NWS Raleigh WRN Ambassador of Excellence recognition! Thanks to all SKYWARN spotters! Please check out the following: http://noaa.maps.arcgis.com/apps/MapTour/index.html?appid=8c6216efbaa24af8b24336a571b528a8 ….this is a web page that NWS HQ put together that recognizes all of the 2017 Ambassadors of Excellence across the county. A great tool that NC Emergency Management recommends for emergencies is ReadyNC. It works both for iPhone and Android phones. Download it today! For people living in or visiting North Carolina, this is an all-in-one FREE tool for emergency preparedness.